Often times due to the high performance applications of PEEK, parts are designed with precise tolerances and finishes. Polyether ether ketone (PEEK) is a colorless organic polymer thermoplastic used in engineering applications. This is very common in fluid applications such as seals and manifolds. Holding these tolerances and finishes requires a good knowledge of the machining characteristics of PEEK. Upland Fab has been machining all grades of PEEK for decades, giving us that experience to produce a quality part the first time. When machining the filled grades of PEEK , it is critical to properly manage the stresses in material, our engineers employ precisely controlled processes to control these stresses. 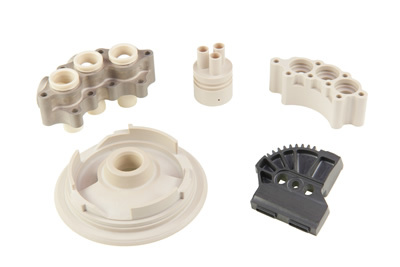 For PEEK polyetheretherketone applications requiring strength and dimensional stability for continuous use up to 500°F, PEEK plastic is the perfect choice. An additional application of PEEK is when good chemical resistance is required, often PEEK plastic is used in place of fluoropolymers when used at elevated temperatures. These properties are suited perfectly for use in the medical, aerospace, semi-conductor, and oil and gas industries. PEEK materials can be purchased in sheet, rod, and tube formats with unfilled, 30% glass-fiber and 30% carbon fiber reinforced and bearing grade options. Upland Fab employs the use of multi-axis machining when working with PEEK. This application of technology is critical to ensuring the parts are machined correctly the first time with minimal handling and fixturing. Often times even the most complex parts are completed in a single operation. Upland Fab machines complex PEEK components directly from customer-supplied CAD models. Our DPD/MBD (Digital Product Definition, also referred to as Model-Based Definition) processes allow us to reduce manufacturing errors, which in turn allows us to produce PEEK parts at a very low cost. Have questions about our DPD process? Contact Us to discuss your PEEK project. At Upland Fab, communication is a top priority. By providing reliable, consistent communication to our customers, we are able to offer something that our competitors don’t: peace of mind. As an Upland Fab customer, you will work with a single point of contact who will keep you up-to-date on the progress of your project – every step of the way. Discover the Upland Edge and Contact Us Today! Upland Fab is an industry leader in PEEK machining. You’ll discover the reason why when you Contact Us to discuss your project. Or send us a Request for Quote on your next project! Contact Upland Fab today to learn more about PEEK Machining. At Upland Fab, communication is one of our top priorities. By providing reliable, consistent communication to our customers, we can offer something that our competitors don’t: peace of mind. As an Upland Fab customer, you will work with a single point of contact who will keep you up-to-date on the progress of your PEEK polyetheretherketone project – every step of the way. Contact Upland Fab today to learn more about PEEK Polyetheretherketone. 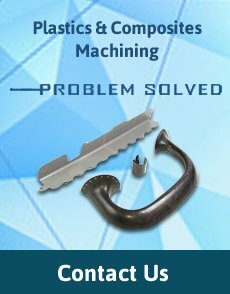 Upland Fab has been providing top-flight plastics & composite machining in Southern California Since 1970. Contact us today for more information or request a quote. We look forward to hearing from you!